It is with sadness and deep admiration that we say goodbye to Senator John McCain, who died on Saturday, August 25 from brain cancer. Senator McCain was a genuine champion of freedom, human dignity, and a true American hero. A consummate public servant, he dedicated his life to advancing the best of American ideals at home and around the world as a passionate defender of human rights, who never stopped fighting for the persecuted and making the world a better place. 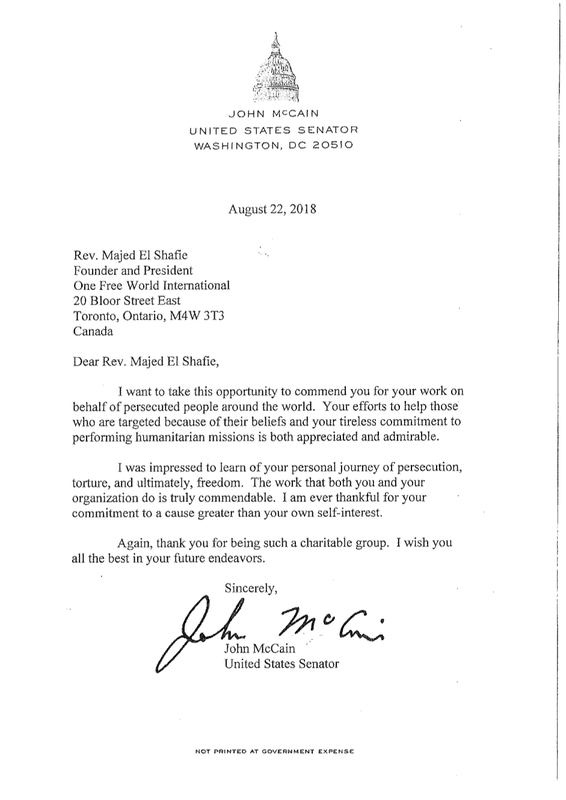 We were moved to receive a very touching letter recognizing OFWI's work from Senator McCain just last week. We all will pray for his soul, America, and Senator McCain's loved ones as we mourn the loss and celebrate his life. Thank you, Senator McCain. May you rest in peace.